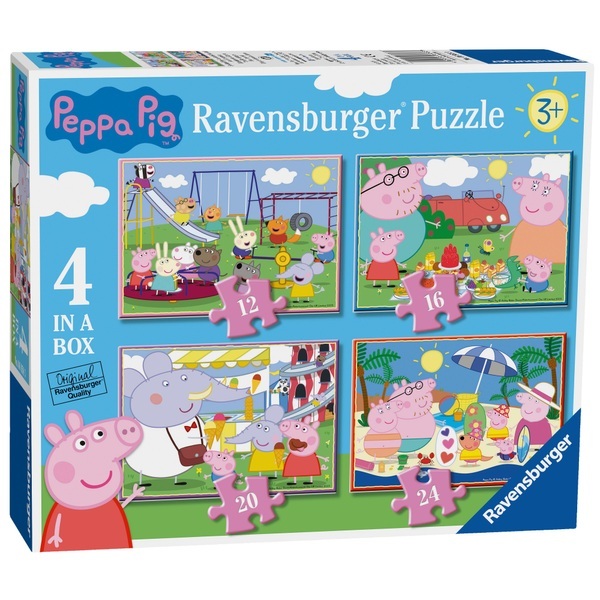 This Ravensburger Peppa Pig 4 in a Box Jigsaw Puzzles let you piece together 4 bright and colourful images of Peppa Pig and friends enjoying lot of fun days out. Piece together Peppa Pig, George Pig, Suzy Sheep, Rebecca Rabbit, Emily Elephant, Danny Dog, Candy Cat, Pedro Pony, Richard Rabbit, Freddy Fox playing at the park , or join Peppa, George, mummy and daddy pig at a picnic or at the beach, or piece together Peppa, George, Emily Elephant and Mr Elephant at Potato City. Four high quality cardboard jigsaw puzzles in 12, 16, 20 and 24 pieces.